At Patio Place, we provide Fullerton businesses and residents with the best pricing on brand name patio furniture, umbrellas, bar stools, fire pits, barbecues, gas logs, and more. We specialize in securing incredible deals from the industry's leading brands, including Alu-Mont, Fire Magic, Galtech, Hanamint, Kings Rattan, Ratana, Sunset West, Treasure Garden, and more. In business since 1989, we have long-standing relationships with these and other manufacturers, which allows us to negotiate rock-bottom prices on off-season merchandise and closeouts from the previous year. We also provide Fullerton customers with cost-saving solutions for their existing patio furniture and equipment, such as custom replacing outdoor cushions, pillows, and slings; restringing, recovering, and repairing patio umbrellas; and supplying and installing replacement BBQ parts. With all that we offer, we've been trusted to help thousands of customers furnish their Fullerton and other Orange County outdoor spaces, including patios, decks, gardens, terraces, verandas, pool areas, and more. We pride ourselves on offering unparalleled customer service and go the extra mile to meet every client's needs. Our staff is highly experienced, and some of our employees have as many as 50 years of industry experience. So, you know that you can count on us to provide you with trustworthy, knowledgeable recommendations that fit your specific budget, decor, and other needs. We're also happy to arrange same-day delivery. Our delivery service includes disposal of old patio furniture and the cleaning of your outdoor space before assembling and arranging your new outdoor furniture and accessories. To learn more, give us a call today or visit us at 845 Baker Street (between Bristol and Bear) in Costa Mesa, CA. For Fullerton's best deals on extruded aluminum, cast aluminum, and wicker patio furniture, choose Patio Place. 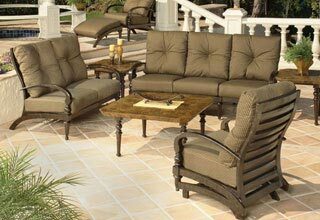 We carry a huge inventory of significantly discounted, brand name patio furniture, including a complete selection of patio sets, sectionals, dining chairs, swings, sofas, benches, lounge chairs, lounge beds, chaise lounges, loveseats, bar stools, ottomans, and more. Most of our inventory is stocked and ready for same-day delivery, but we can also special order patio furniture to suit your unique style and tastes. We can also restore existing patio furniture in Fullerton to like-new condition. We offer revitalizing treatments to worn patio furniture frames, custom fabricate replacement outdoor cushions and pillows, and replace patio chair slings and straps. Call us today to learn more about our patio furniture sales and repair services, or our selection of over 600 quality outdoor fabrics from Sunbrella, Phifer, and original patio furniture manufacturers. Available for the lowest prices in Orange County, our high-quality patio umbrellas will deliver long-lasting value to those in Fullerton. 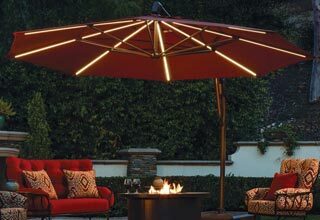 We sell the industry's best patio umbrellas from Galtech, NorthCape, Treasure Garden, and other leading manufacturers. At our showroom we stock gorgeous cantilever umbrellas, auto-tilt umbrellas, table umbrellas, push-to-tilt umbrellas, side-post umbrellas, easy-track umbrellas, and more. From 9 to 13 feet in height, and 6 to 13 feet in diameter, our patio umbrellas will accentuate any Fullerton outdoor space, no matter the size, decor or layout. We also sell umbrella lights, bases, and other accessories, and can customize your umbrella with a business name or logo. 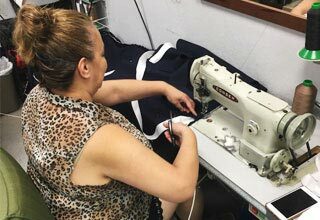 For patio umbrellas in disrepair, we offer skilled rib replacement, restringing, and recovering services using quality fabrics from Sunbrella or Phifer. Our umbrella fabrics all come with manufacturer wrranties. Call today. We offer Fullerton a wide selection of top-quality barbecues, grills, and portable carts from Fire Magic, as well as the market's finest gas logs from R. H. Peterson and Real Fyre. Available for some of the best prices in all of Orange County, our barbecues and grills can fit most barbecues islands and are available in 24" x 18", 30" x 20", 36" x 20", and 48" x 22" sizes. We can deliver and install most of the barbecues we sell, as well as perform propane or gas conversions, and replace and install common barbecues island parts, such as hoods, ranges, warmers, drawers, lights, access doors, kegerators, fridges, and more. We can also deliver and install our entire collection of gas logs at your Fullerton home or business, which includes hooking up your gas logs up to an existing gas line. Call today to learn more. Visit us today for the best value on brand name fire pits, fire tables and bar stools. Serving Fullerton, we sell and deliver fire pits, fire tables, and bar stools from the best names on the market, including Alumont, Hanamint, OW Lee, and others, all at incredible prices. 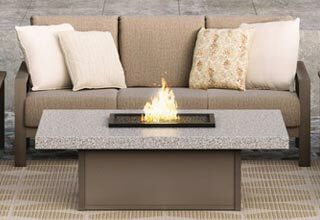 Our fire pits and fire tables feature granite, slate, marble, cast aluminum, and many other materials, and can be enhanced with beautiful fire pit domes, reflective fire glass, ceramic gas logs, lava rocks, and other fire pit accessories. We also offer attractive bar stools and patio seating, which will perfectly complement any fire pit, fire table, or other outdoor space in Fullerton. Visit us today to learn more.